Last time, we spent Rosh Hashanah with soldiers in 1918 France. Now we meet other Jews observing the holidays far from home: Ottoman Jews staffing the Turkish Village at the 1893 World’s Fair. This description of their Yom Kippur services—published in 1901 but probably written earlier—reflects the exoticism that pervaded writings about the fair. 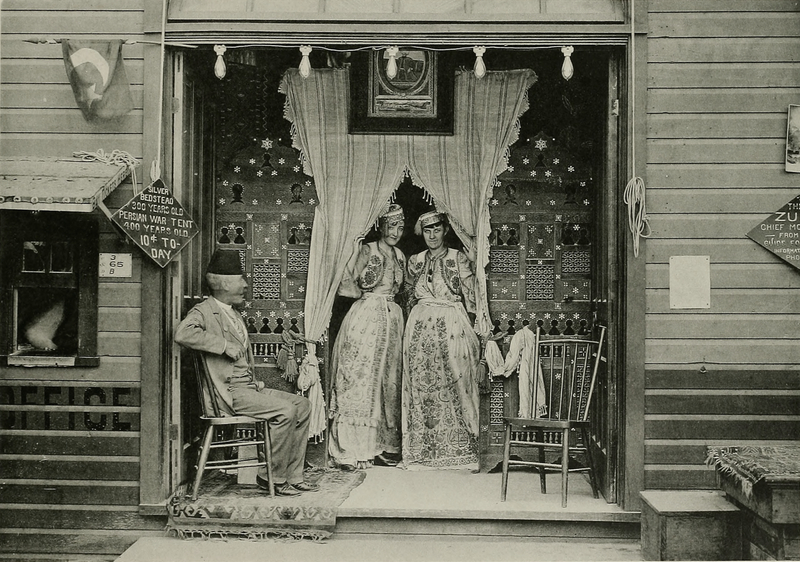 Entrance to the Turkish Village on the midway of the World’s Columbian Exposition in Chicago. Most of the village closed for Yom Kippur. About four-fifths of the inhabitants of the Turkish village on the Midway Plaisance at the Chicago Exposition were Jews. Merchants, clerks, actors, servants, musicians, and even the dancing girls, were of the Mosaic faith, though their looks and garb would lead one to believe them Mohammedans. That their Judaism was not of the passive character was demonstrated by the closed booths, shops, and curio places, by the silence in the otherwise noisy theaters and the general Sabbath day air which pervaded the “Streets of Constantinople” on Yom Kippur—the Day of Atonement. A more unique observance of the day never occurred in this country, and to the few Americans who had the good fortune to be present it presented a picture of rare beauty and solemnity. The Turkish mosque was so arranged that it could be used as a Jewish house of worship also—the paraphernalia was all there and the Moslem is liberal enough to allow religious service other than his own to take place in his houses of worship—a point which he thinks the Western people would do well to ponder.